To move the seat forward or backward, pull up on the lever under the front edge of the seat cushion, slide the seat to the desired position, and release the lever. 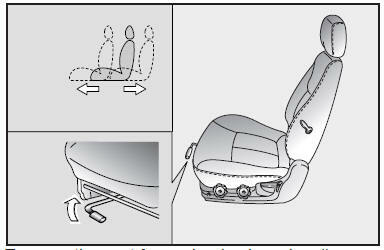 To ensure the seat is locked in position, check for any seat movement. Loose objects in the driver’s foot area could interfere with the operation of the foot pedals, possibly causing an accident. Loose objects might interfere with the seat slide mechanism. Do not place anything under the front seats.